I’ve been stalking this squirrel all week. It’s far more timid than other grey squirrels which I suppose has helped it to survive. I took this during a ten minute stand off. I lost patience first and tried to get closer, then ignominiously slipped down a bank. This is the third time I’ve seen a white squirrel. The last time was about ten years ago in neighbouring Newton Wood; before that, another ten years or so here in Cliff Riff Wood. That regressive gene keeps making a comeback. 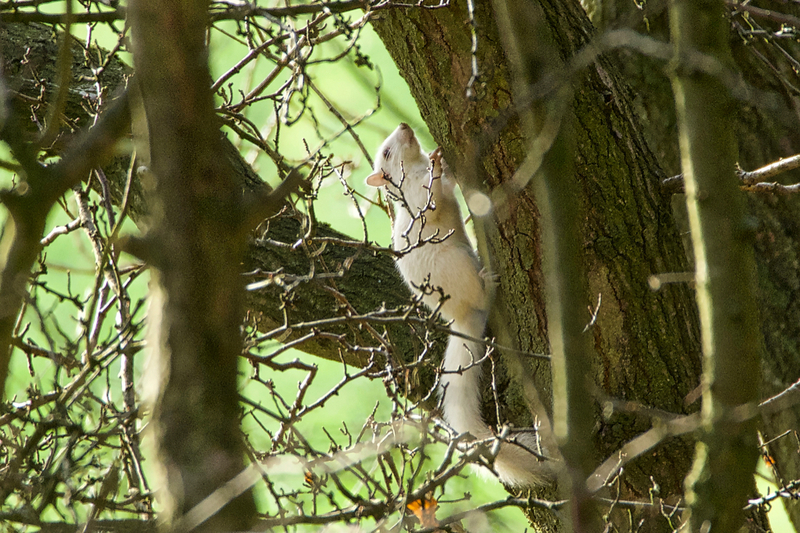 To me its eyes don’t have that distinctive pink look which would indicate it is not an albino squirrel but suffering from a condition known as leucism, which is the partial loss of pigmentation.